I’ve never been one to be overly concerned about whether a bird “counts”. People, and organisations, have complex and elaborate rules about whether a bird you saw or heard actually is a bird you saw or heard, which seems a very unnecessary way to add complexity to an already complex hobby. But I do have rules about whether I can have said to have visited a country, ie does the country “count” which I have inherited from my family, particularly my Dad. Generally, I need to have cleared immigration and/or spent some time in the country actually visiting it. I have caught a bus across Europe, but I can’t really claim to have “been” to Germany or Belgium. I slept in hotel in Zurich but didn’t leave the airport or even clear immigration, so I can’t really say I’ve been to Switzerland either. But I have visited Guatemala, Lesotho and Zimbabwe to actually visit them and count them, even though I spent less time in them than I did Zurich. It’s arbitrary, but there you go. I bring this up because birding the Chobe River in northern Botswana gave me the interesting opportunity to bird a country I technically wasn’t in. 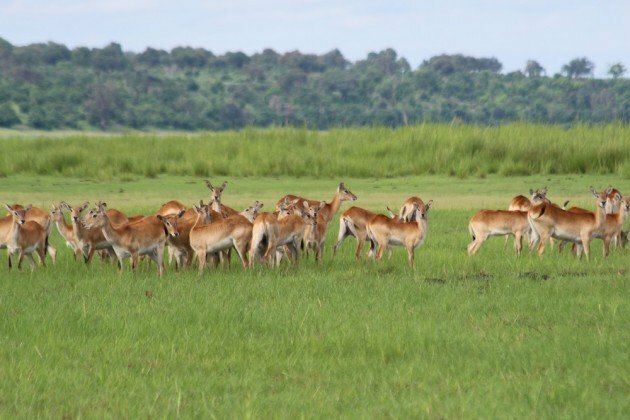 Leaving from the border town of Kasane we meandered westwards along the northern edge of the massive Chobe National Park to our left and the far eastern tip of Namibia’s Caprivi Strip. Even without being on the water it was possible watch birds across the river, as evidenced by my lifer pair of African Pygmy Geese, which flew down the river and landed on the Namibian side. It’s even possible to count exactly the same bird for both country’s lists. It makes for complicated note keeping, especially when you have to continuously ask the guide whether that particular stand of rushes, papyrus or sand is technically Botswanan or Namibian (in the case of one island the matter actually was resolved by the United Nations). The river cruises up the Chobe River are most famous for the dry season aggregations of African Bush Elephants drawn to the year-round water. We visited in the rainy season, to the point where our first attempt to head out was ended by a particularly monsoon-like downpour. But even without huge herds of elephants large game is defiantly the major draw for most people on the cruise. 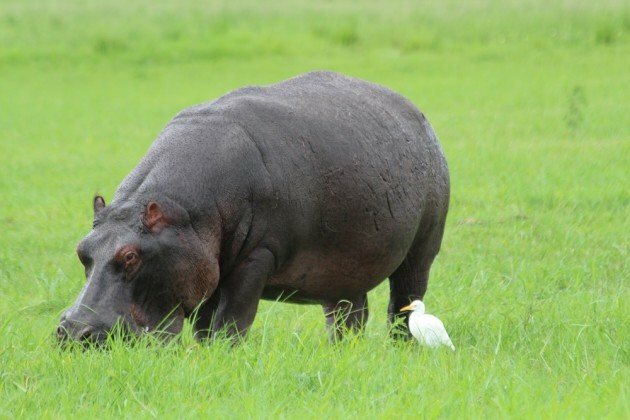 Hippos are one such attraction, and Mum pointed out she was much happier seeing them on the large party boat we were on than the dugout canoe she saw them on when we were in Uganda. Nile Crocodiles, Waterbuck and Impala are also very common around the river. 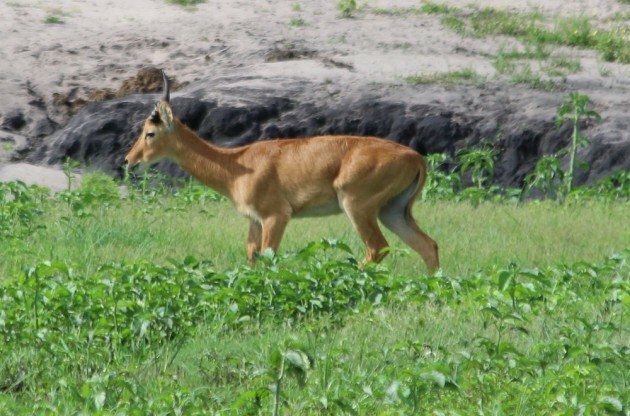 The floodplain of the Chobe is the only place in Botswana where the aquatic Puku is found, you may need the help of the guide to tell it from the other, more common water antelope, the Red Lechwe. But you haven’t come here to read my writing about mammals or reptiles, so, yeah, there are also lots of birds. In particular, there are lots of waterbirds. 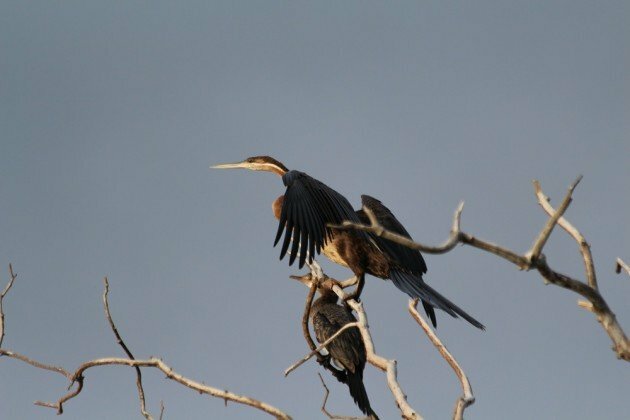 Along with the tiny pygmy geese there is Africa’s largest duck, the Spur-winged Goose, and perched high on dead branches above the river were White-breasted Cormorants (a subspecies of the Great Cormorant according to some), Reed Cormorants and African Darters. Well-travelled birders will recognise Cattle Egrets following the steps of hippo or African Buffalo, and Black-crowned Night Herons, but more African species occur in the form of the massive Goliath Heron, the smaller Squacco Heron, and the highly distinctive Black Egret, famous for creating a canopy with its wings to hunt small fish. 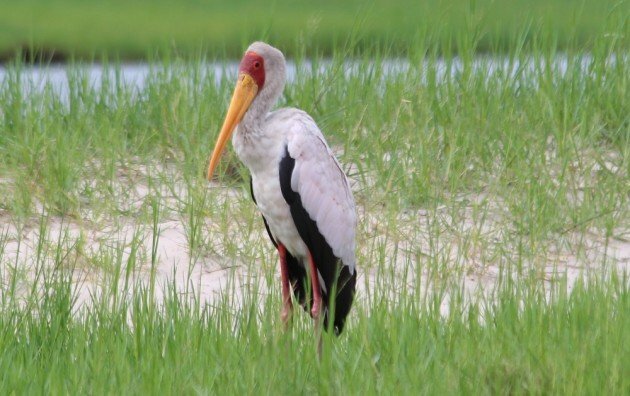 Also noticeable are the African Spoonbills, Glossy Ibis, African Openbills and Yellow-billed Storks that patrol that water’s edge, even if most of them wouldn’t look out of place anywhere else in the world. Waders are well represented. Along with the ubiquitous Blacksmith Plover (or Lapwing), the odd looking White-crowned Plover shared the grassy areas with Long-toed Plovers. 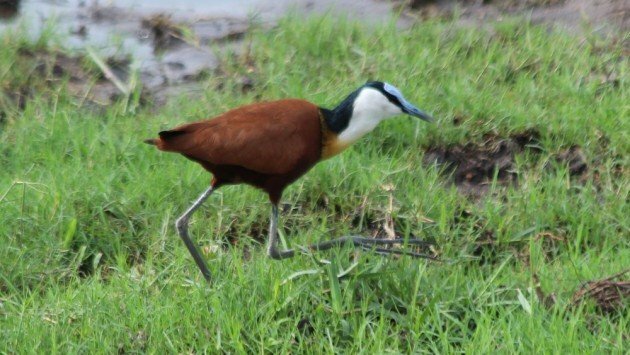 African Jacana used their splayed feet to move quickly through the more waterlogged areas, and occasionally a pair of Water Thick-knees would regard the passing boat with mournful oversized eyes. Not a wader, but noticeable as one of the larger birds of the floodplains, Kori Bustards also strode around imperiously. Perched high above the river were a number of birds of prey, including the one with the most evocative call of the African bush, the African Fish-eagle. A guide once told me that they were related to the Bald Eagle of North America and I dismissed him, claiming it was convergent evolution, I was wrong, and guide who’s name I have forgotten, I’m sorry. Anyway, along with the eagles were Brown Snake-eagles and Gymnogenes (or African Harrier-hawks), a goofy looking bird that is one of my favourite birds of prey anywhere. On smaller overhanging branches Blue-cheeked and White-throated Bee-eaters hawked for insects. Hidden amongst the reeds and grasses were other treats. My favourite was a family of Hartlaub’s Babblers on the Namibian side, and a bright jewel of a Malachite Kingfisher on the Botswanan side. There are doubtless many drab warblers amongst the reeds, but the only I was able to ID was an African Reed Warbler. Thick-billed Weavers and Fan-tailed Widowbirds represented the seed-eaters, and an African Stonechat made very little effort to remain hidden. I’ve written before about the joys of birding from a boat along rivers and lakes. 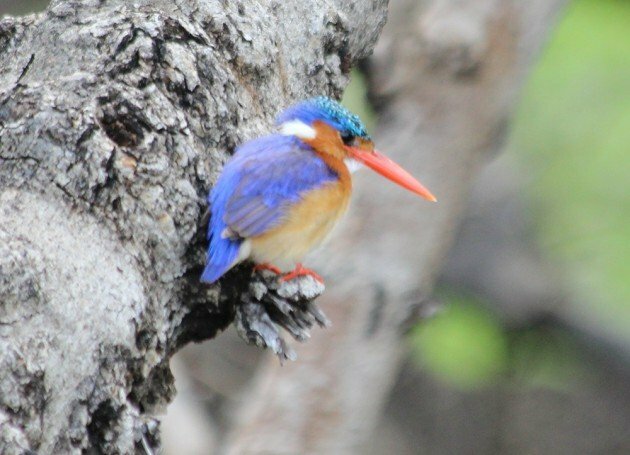 Lacking the nauseating movements of sea trips, they represent the zenith of birding in comfort, and you would be hard-pressed to find a more dazzling selection of marvels that Botswana’s Chobe River. So go there now! We couldn’t agree more with Duncan’s comments on the Chobe River and the joys of river birding. Being in a boat is much more appealing than the bumpy, dusty game drives in a Land Rover. 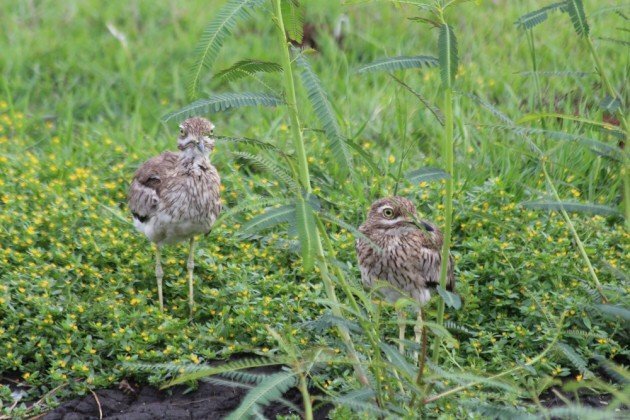 Staying near Kasane is perfect because you can also take game drives in a Land Rover where you can see even more of the avian diversity than by just staying on the water. We planned our days to spend time each day on both land and water. The African Jacana and Malachite Kingfisher are gorgeous! Great photos! The Chobe River is a favourite of mine. I think that your photo labelled Wood Sandpiper is a Marsh Sandpiper though. @Jenny – Is it? Drat. 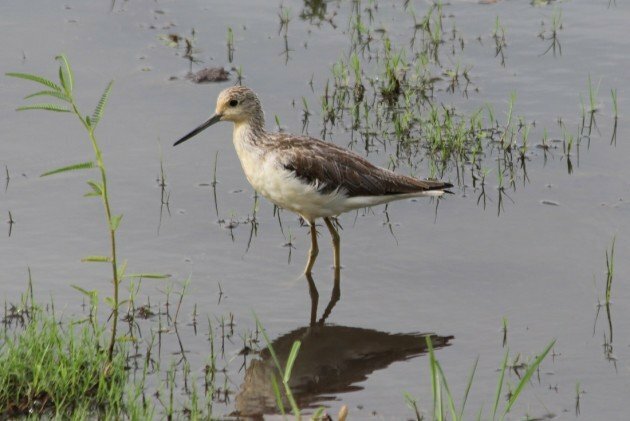 I am hopeless at wader ID. Yes, it is. A Wood Sandpiper would show a lot of white spots on the back and a very distinct pale supercilium which extends behind the eye. I battle with waders in breeding plumage because we generally see them only in non-breeding in this part of the world. @Jenny & Duncan: Jenny’s right. Boy, I loved the Chobe everytime I was there during the late 1990’s. One of my favourite places on earth. The conundrums of birding on a river bordering two countries is well-known to those of us who have birded the lower Rio Grande Valley in Texas. Which reminds me to submit an eBird checklist for the kingfishers I saw in Mexico from Texas in 2013. The thought of doing that back then sorta blew my mind since, like you say, I wasn’t IN the country.